We begin every school year with a Sullivan Rocks Kick-Off Assembly to talk with the children about what the expectations are in the school. During the first week, students practice what is expected in the hallway, in the bathroom, in the lunchroom and recess area, during dismissal, and on the bus. All staff, parents, and children will know what expected behaviors look like in the school. This approach is called PBIS (Positive Behavioral Interventions and Supports). PBIS is a research based approach to establish behavioral supports needed for all students to be successful socially, emotionally, and academically. Clear expectations are taught, modeled, and reinforced across all settings by all staff members. Research has shown that consequences without positive strategies is ineffective. Teaching the behavioral expectations and recognizing students' expected behavior is an important part of a child's education to help them be successful in school and in society. The purpose of PBIS is to create a positive school climate. 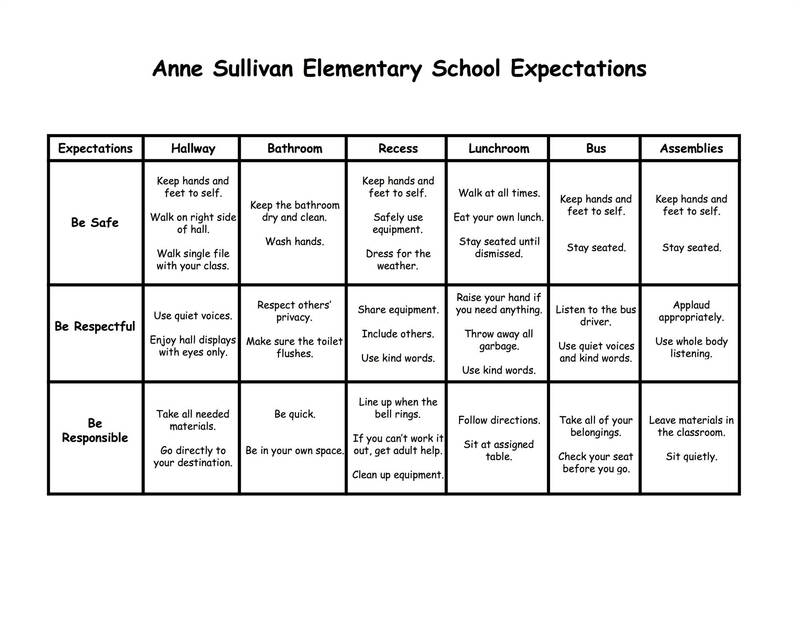 The organization of this system was completed by the PBIS Team, made up of a group of Anne Sullivan staff. Then plans were discussed and reviewed as an entire school. We hope that you will work with us to enhance the school climate at Anne Sullivan School. There are posters hanging in the school with the three basic expectations of Be Safe, Be Respectful, and Be Ready. There are also posters which list the locations in the school and how students will Be Safe, Be Respectful, and Be Ready in each area. Each teacher has this poster hanging in the room. Students are recognized for following the expectations by receiving a Class Dojo point. Students can collect weekly raffle tickets based on their Class Dojo points, and we have weekly drawings to recognize positive behavior.